Going through the reading matter about Cape Town’s new wine district, I was surprised at how relatively simple it all sounded. Producers from Constantia and Durbanville get an idea. Apply to the Wine and Spirits Board’s Demarcation Committee to check out the possibility of creating a district based on the regional, geographic similarities between Constantia and Durbanville. Committee approves it after detailed research. The new district gets advertised for objections. None. And hey presto, Wine of Origin Cape Town is born. And what a terrific development, attaching two old wine area’s to the world-wide success of the Cape Town brand. Not many saw that one coming. One of the most important possible consequences of Wine of Origin Cape Town is a juicy number. If Durbanville and Constantia could pull it off, how many other patches of divided South African geography are there to be revisited with the aim of forming new districts or wards? 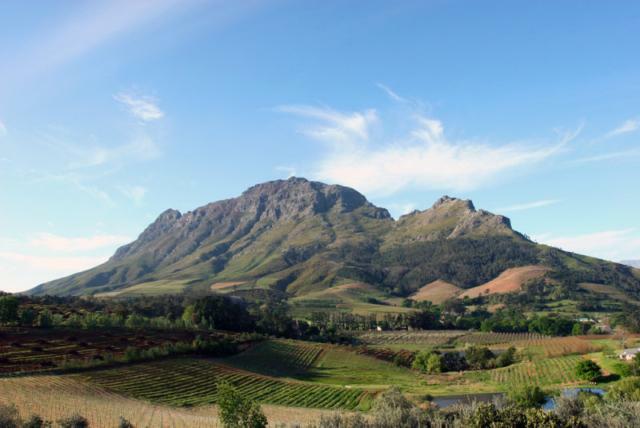 Take Simonsberg, the majestic mountain that is also one of the gems of the Stellenbosch wine district in terms of provenance and quality. Although the mountain is one unit to normal faculties of perception, Simonsberg is split into two regions. On the south-western side, the ward Simonsberg is attached to the district of Stellenbosch. And includes a number of blue-chip wineries such as Kanonkop, Muratie, Delheim, Tokara and Thelema. All fair and good. But the north-east slopes are excluded from Stellenbosch and thrown under the still unsexy and sleepy Paarl district. This includes Backsberg, Glen Carlou, Babylonstoren and Nobel Hill. Thankfully, the way Wine of Origin Cape Town came into being shows that the older ways are up for renewal. With producer willingness and co-operation, the ears of the authorities can be bent. Constantia and Durbanville, 45km apart, and one district. Simonsberg Paarl and Simonsberg Stellenbosch but an acorn’s throw over the mountain. Speaking from outside RSA, I think the problem with the name is that it has the word ‘Town’ in it. Cape Town to me means the urban sprawl that is the city and connurbation of Cape Town. To me it doesn’t mean the farmlands and vineyards you find when you leave the city behind. Bordeaux, Beaune, Dijon, Epernay are all cities but the names also encompass the winelands around (and for many of use we first encountered the names on bottles of wine). Bordeaux City etc means the town. Nope, I think Cape Town as the name of a WO is offputting.